Need a weight-loss kick-start? No need for extremes: Simple moves can work just as quickly as big ones. Need a weight-loss kick-start? No need for extremes: Simple moves can work just as quickly as big ones, says Harley Pasternak, celebrity trainer and author of the new book 5 Pounds: The Breakthrough 5-Day Plan to Jump-Start Rapid Weight Loss (and Never Gain It Back!) ($16, amazon.com). He recommends eating three meals and two snacks per day that have protein, fiber, and healthy fats. 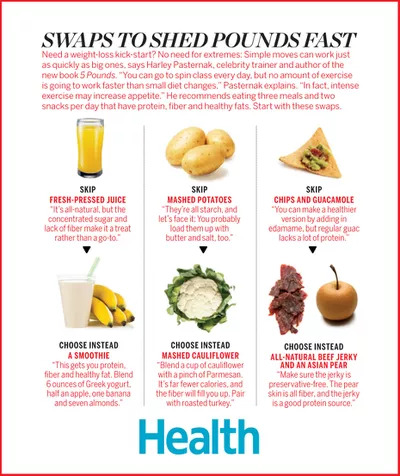 Start with these healthy swaps.